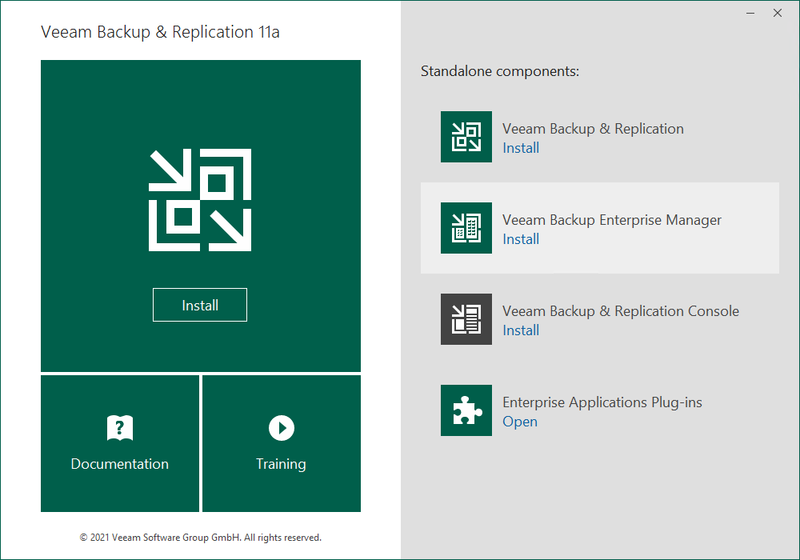 Download the latest version of the Veeam Backup & Replication installation image from https://www.veeam.com/downloads.html. Use disk image emulation software to mount the installation image to the machine where you plan to install Veeam Backup Enterprise Manager or burn the image file to a blank CD/DVD. If you plan to install Veeam Backup Enterprise Manager on a VM, use built-in tools of the virtualization management software to mount the installation image to the VM. To extract the content of the ISO, you can also use the latest versions of utilities that can properly extract data from ISOs of large size and can properly work with long file paths. In the Standalone components section of the splash screen, click Install Veeam Backup Enterprise Manager. Before installing the product, the setup will analyze the prerequisites and prompt to install .NET Framework if it is missing on the machine. Click OK to install this component. After you install the component, you will have to reboot your computer. It is strongly recommended that you install Veeam Backup Enterprise Manager using Autorun or the Setup.exe file. If you run other installation files from the ISO folders, you may miss some components that need to be installed, and Veeam Backup Enterprise Manager may not work as expected.